Considering 177 Colorado School Districts as Dr. Smyser’s (competition?) 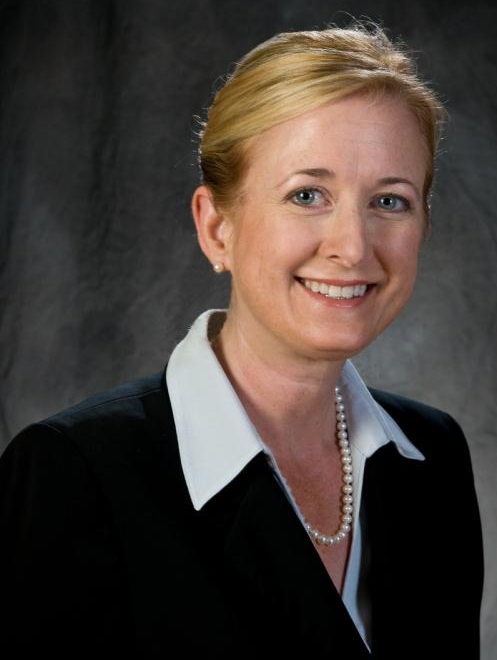 for the Award of – “Colorado’s Superintendent of the Year”, as chosen by the Colorado Association of School Executives everyone here should be proud of Dr. Smyser. The ECT folks would also like to recognize the Teachers and Administrators (in particular Melissa Rewold-Thuon, Principal of Avon Elementary) – whose work “shrinking the Educational achievement gap” in our Public School system – obviously formed the basis for Dr. Smyser’s outstanding award. 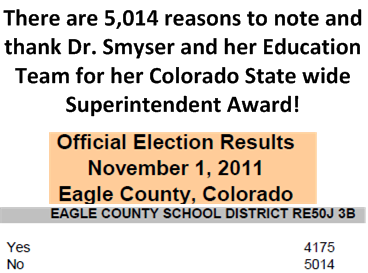 The ECT would also like to note that this achievement by Dr. Smyser and her team of Educators – is especially satisfying because it was earned at a time when the Eagle County voters – said “NO” to approving additional money for Public Schools – via Ballot question 3B – last November 2011. The ECT folks would also like to point out the example of Dr. Smyser’s (and her team of Educators) Achievement – to the other the Taxing Authorities in Eagle County – that themselves are looking to raise our Taxes, via our Ballot on question 5A – the (Eagle River Fire Protection District). Looking forward to next years Ballot in our Eagle County Community, Dr. Smyser? Dr. Smyser the ECT folks would like you and your Team of Educators/Administrators to consider promoting/electing a new majority on the Board of County Commissioners – that is willing to put the Question of the Repeal of our County’s Open Space Tax – right next to our (School Board’s future Question?) of more Funding for our Public Schools on – November 2013 County Ballot. Agreed, several things will have to happen in the future to make this Community idea a future reality. It’s a question of Priorities in our Community – Dr. Smyser, we all know we don’t have unlimited Tax dollars. The ECT folks believe we need a new leadership team elected in Eagle County that is dedicated to leading that important discussion – and ultimately allowing our voters to decide via the Ballot – what our Communities Priorities are and should be. The ECT folks look forward to continuing to help make Eagle County – the best place to live, work, educate and recreate in Colorado. We need more people like Melissa and less Phd’s if we are going to turn education around in this country.